"It is with extraordinary sadness we can confirm the death of our friend and colleague, Anthony Bourdain," CNN said in a statement. Anthony Bourdain, the frenetic celebrity chef and television host who took viewers on a culinary journey through more than 80 countries and spoke candidly about his past descent into drug addiction, has died, CNN said Friday. He was 61. The network reported suicide was the cause of death. "His love of great adventure, new friends, fine food and drink and the remarkable stories of the world made him a unique storyteller," the network said in a statement. "His talents never ceased to amaze us and we will miss him very much. Our thoughts and prayers are with his daughter and family at this incredibly difficult time." Bourdain had been in Strasbourg, France, near the German border, working on an episode of the Emmy Award-winning CNN series, "Anthony Bourdain: Parts Unknown." French police told NBC News that his body was found in his room at the Chambard Hotel, southwest of Strasbourg. CNN earlier reportedthat French chef and close friend Eric Ripert discovered him. Ripert, who shared a playful banter with Bourdain on episodes of "Parts Unknown," remembered him in a statement to NBC News as "an exceptional human being, so inspiring and generous. One of the great storytellers of our time who connected with so many." "I wish him peace," he added. In his shows, which also included the Travel Channel's "No Reservations," Bourdain globe-trotted to scores of countries, telling colorful stories that wove local tastes and flavors while showing reverence to history and people and showcasing his own unflappable charm. He was unafraid to eat foods that would make most others wince — including raw seal eyeball from Canada, roasted sheep's testicles from Morocco and cobra heart from Vietnam. "Your body is not a temple, it's an amusement park. Enjoy the ride," he wrote in his breakout 2000 memoir, "Kitchen Confidential: Adventures in the Culinary Underbelly." As a writer, he favored the works of George Orwell, William S. Burroughs and Joan Didion. Bourdain, who was born in New York and grew up in the suburbs of New Jersey, graduated from the Culinary Institute of America in 1978. After working in several kitchens, he gained recognition for "Kitchen Confidential," which described in vivid detail the dark and drug-fueled world that dwelled within the industry and among those working in the trenches. "You might get the impression from the specifics of my less than stellar career that all line cooks are wacked-out moral degenerates, dope fiends, refugees, a thuggish assortment of drunks, sneak thieves, sluts and psychopaths," he wrote. "You wouldn't be too far off base." His best-selling book grew out of a New Yorker article, "Don't Eat Before Reading This," in which Bourdain spilled his own trade secrets after working his way up from humble dishwasher to celebrated chef in New York. Bourdain was open about being a former heroin addict, and he seemed to revel in his reputation that stripped away a more wholesome image of master chefs in pristine white. The Smithsonian called him "the original rock star, the Elvis of bad boy chefs." 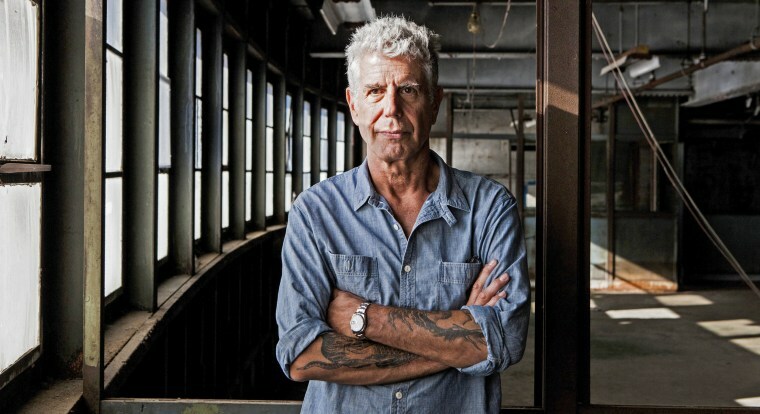 In various interviews, Bourdain spoke about how he was given several chances in life while addicted to drugs in the 1980s and lost friends to overdoses and drug abuse. He began to turn his life around when he realized his talents were in the kitchen, although he said he spent years worrying about being in debt and having no health insurance. He also drank, something he still enjoyed and acknowledged as he traveled and partied in exotic destinations for his TV shows. "I became successful in my 40s. I became a dad in my 50s. I feel like I've stolen a car — a really nice car — and I keep looking in the rearview mirror for flashing lights," he told Biography in 2016. "But there's been nothing yet." Bourdain's death follows that of another celebrity, fashion designer Kate Spade, who was found dead of suicide this week at age 55. They both hanged themselves. Federal health officials reported Thursday that suicide rates are up by 30 percent across the nation since 1999, and only about half the people who died by suicide had a known mental health condition. Bourdain's death stunned some of those who knew him. "Bizarre Foods" host Andrew Zimmern tweeted that his heart was "truly broken" over his friend, and that "the sad cruel irony is that the last year he'd never been happier." Bourdain, who was twice married, had been dating Asia Argento, the Italian actress and director who has accused former Hollywood producer Harvey Weinstein of sexual assault. He tweeted a video earlier this week of him in Hong Kong, dancing and laughing with Argento and his show's production crew. Bourdain recently told IndieWire magazine that he was "so proud" of Argento for speaking out at the Cannes Film Festivel in the wake of the global #MeToo movement. The sharp-tongued chef did not hold back about others who have been accused of sexual abuse, including those within his own industry. Argento said Friday on Twitter that Bourdain was "my love, my rock, my protector. I am beyond devastated." Actress Rose McGowan, a #MeToo leader, tweeted an emotional video after learning of Bourdain's death: "The world is not better without you ... Asia [Argento] needed you, Anthony," she wrote. Even President Donald Trump said Friday that his "heartfelt condolences" were with Bourdain's family. "I enjoyed his show," he told reporters on the White House's South Lawn. "He was quite a character." Those in the culinary world also shared stories about the impact that Bourdain had on their own lives. Michele C. Massari, who runs a string of New York restaurants, said "Kitchen Confidential" inspired his career. "A friend of mine gave me his book when I was living in Bali and told me you should go back to doing what you love most," Massari said. "If that book wasn't in my hand, I wouldn't do what I'm doing." TV chef and restaurateur Gordon Ramsay tweeted that Bourdain was special: He "brought the world into our homes and inspired so many people to explore cultures and cities through their food." The Travel Channel, which aired Bourdain's show "The Layover," from 2011 to 2013, remembered him as a "global ambassador." "He was an incredible talent who showed us beautiful, gritty, complicated and delicious places in every corner of the world," the network said. "His wit and perspective will be missed." If you or someone you know is in crisis, call the National Suicide Prevention Lifeline at 800-273-8255, text TALK to 741741 or visit SpeakingOfSuicide.com/resources for additional resources. Claire Atkinson and Nancy Ing contributed.